This morning I had a bowl of berries, 3 pecan halves, a small orange and 3 organic eggs. 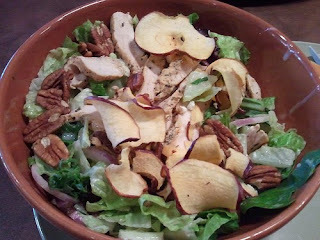 Jeffrey and I had a lunch date at Panera. I got the Fuji Apple Chicken Salad. While I used only half the dressing, I did keep the Gorgonzola cheese on there. It just seemed to me like such a small amount of dairy for the flavor impact it imparts. I couldn't finish my whole salad, may munch on it as the work day wears on or have it for dinner tonight along with a baked chicken breast. Tomorrow I am definitely ready to indulge my desire for grass-fed beef and guac! Still not sure on how much fat I should be consuming. Hopefully the "After" photos of the Paleo Challenge will prove I'm doing a good job.....hopefully. I just can't stomach salads. I usually grill or saute' my vegetable. Something about the texture of raw vegetables. Nothing like grilled asparagus. Yum. My grandpa grew THE BEST asparagus in the world. You've ignited my cravings!